From the Star Wars collection by Plasticolor. Star Wars Stormtrooper Speed Grip Steering Wheel Cover. From the Star Wars collection by Plasticolor. 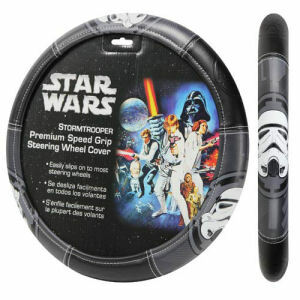 Star Wars Stormtrooper Speed Grip Steering Wheel Cover. Embossed for durability and style. This cover has a comfortable leather-like feel. The molded core stretches snuggly around the steering wheel in seconds on most vehicles.